I have a soft spot for Shepherd Neame; being a Kentish Man I’m fairly sure that the first beer I ever ordered by name (rather than asking for “bitter”, or to be honest back in those days “cider”) was Spitfire. They may not have a reputation for bleeding edge craft beers dripping with American hops but they certainly know a thing or two about “proper” English Ale. 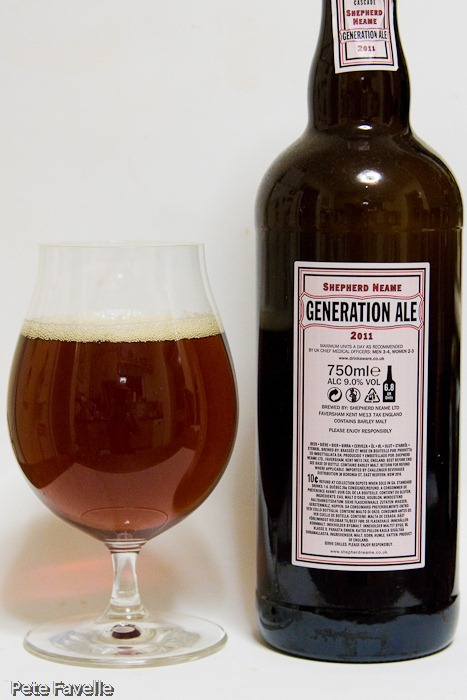 This is their Generation Ale 2011, a 9% ABV monster made with five malts and five hops to celebrate five generations of Shepherd Neame as an independent family brewery. At £17.50 a bottle it’s not a cheap drink, but you get a wine bottle-full of seriously strong beer that’s been well aged. It may be priced similarly to a mid-range bottle of wine, but perhaps that’s not an unfair comparison. It’s a crystal clear, rich copper ale with a very fleeting head. The nose is restrained; there’s a definite alcohol heat along with some biscuity malt aromas, a little brown sugar, some tantalising earthy hops and just a suggestion of orange zest. In the mouth it’s anything but restrained – fairly light and slightly sweet at first, with perhaps just a touch too much fizz. As it sits on the tongue, it somehow becomes bigger, more syrup laden and at the same time a rich summer fruit and hop bitterness starts to show through. At the same time there’s a growing warmth of alcohol and an almost sherry-like character starting to appear. The perfectly balanced hops and syrup build to a crescendo and then fade as you swallow, leaving you with the lingering alcohol and a strong desire for another taste. 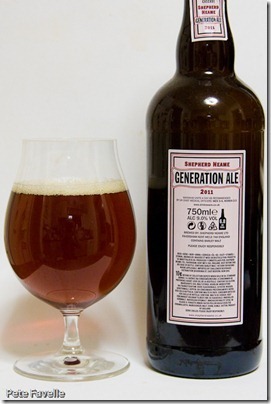 It’s a curious beer; the big alcohol character comes through strongly, but it manages to remain lighter than a barley wine and dangerously drinkable. Simply magnificent! Many thanks to Shepherd Neame who gave Pete Drinks this bottle when we visited last year.